Constructed in the Sui dynasty and partly repainted in the Song and Western Xia dynasties, this cave has a truncated pyramidal ceiling and a niche in each of the south, west and north walls. This cave is also known as the Three-niche cave. The ceiling features laternendecke motifs and lotuses, the center is a three-rabbit motif. In the corners of the motifs are boy-like apsaras, and out of the corners are winged beasts. The outerframe of the square center is decorated with the patterns consisting of honeysuckles, lions and connected pearls. More outside are draperies extending to the four slopes where large-sized sutra illustration are depicted. Each scene is separated by the trees, flowers, temples, fountains, or lotus ponds and clouds. However, the density and discolor of these paintings on the four slopes make it very hard to decipher, therefore, opinions about the contents of the four slopes differ. There are mainly two opinions: 1. they are painted according to the Lotus Sutra, and 2. they are painted based on the Lotus Sutra and the Nirvana Sutra. This description accepts the first opinion. The west niche has a double-recessed entrance with a square bottom and an arch top, housing a seven-figure group: a seated Buddha, two disciples, four bodhisattvas. There upper of the two sides out of the niche is devoted to the Vimalakirti sutra illustration, the image of Vimalakirti on the south and that of Manjusri on the north. Below them are five disciples and four bodhisattvas. On the lower part of the west wall are pictures of the offerings and bodhisattvas painted in the Song dynasty. Both the south and north walls have a square shallow niche in the center housing the statues of a seated Buddha and two bodhisattvas. There are several marks of sovatthika (meaning auspicious) on the lower brim of the kasaya. Around the niche are thousand Buddha motifs. below the niche are bodhisattvas painted in the Song dynasty. There is a preaching scene on the space above the entrance in the east wall, below the preaching scene is an inscription of the Song dynasty (already blurred). To the north of the inscription are two male donors of the Song dynasty, and to the south are one female donor (vague) and a bhiksuni (Buddhist nun). The upper part of the south side of the entrance is covered with the thousand Buddha motifs of the Sui dynasty, and the lower part with six male donors painted in the Song dynasty. Along the entrance is a treasured pagoda of the Song dynasty. The north side of the entrance depicts the thousand Buddha motif of the Sui dynasty in the upper and four female donors and a bodhisattva of the Song dynasty below. Along the entrance is also a treasured pagoda of the Song dynasty. The corridor was repainted in the Western Xia. A medallion pattern is in the center and the draperies are painted on two slopes. Each of the south and north walls have two bodhisattvas. The front chamber was repainted in the Western Xia. On the west slopes are traces of some medallion motifs, beneath which are the Sui dynasty paintings. There is a small niche dug out of the space above the entrance in the west wall, which contains paintings of bodhisattvas and flowers. Out of the niche is a temple image. There are two preaching scenes on the upper part of both the south and north sides of the entrance, and there are vague paintings of donor figures below the preaching scenes. On the north and south walls are part of the draperies and halos. There are donor figures of the Song dynasty beneath the top layer of the paintings. There is a preaching scene on the space above the entrance in the east wall, in which the central Buddha sits in lotus position on a diamond throne, flanked by Mahasthamaprapta on the left and Avalokitesvara on the right. The ten great disciples are behind them. The upper part presents a parasol and bodhi trees as well as two apsaras holding flowers to pay their respect to the Buddha. There is a cartouche of the Song dynasty at the lower part of the preaching scene in which the words have been obscured. On the north side of the cartouche are two secular male donors of the Song dynasty, and on the south, a secular female donor (vague) and a bhiksuni painted in the Song dynasty. On the south side of the entrance, the thousand Buddha motifs of the Sui dynasty are on the upper part and six secular male donors of the Song dynasty on the lower part. 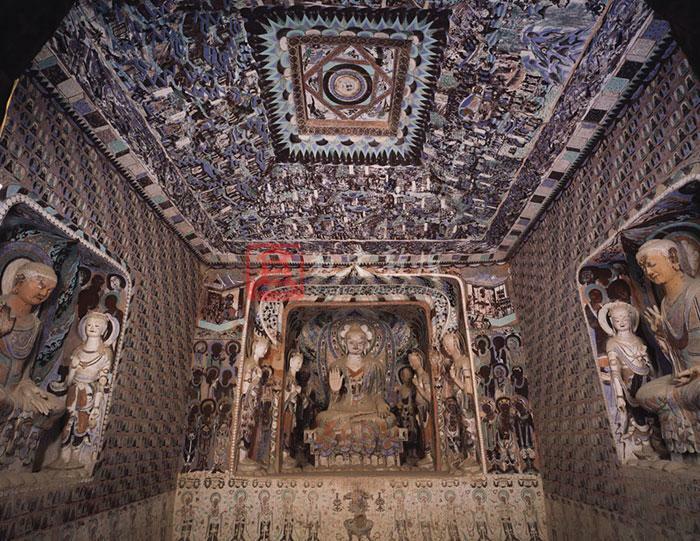 On the north side of the entrance, the upper part is also covered with the thousand Buddha motifs of the Sui dynasty, and the lower part shows four female donor figures and one attendant bodhisattva, both painted in the Song dynasty. Along the frame of the entrance on either side is a pagoda painted in the Song dynasty. Around the central shallow niche in the south wall are the thousand Buddha motifs. The top of the niche has two apsaras and a halo of honeysuckle and flame motifs. Five disciples are painted on either side of the Buddha and a lion is painted on each side of the throne. The brim of the niche is decorated with pearled patterns. There are 15 worshipping bodhisattvas painted in the Song dynasty below the niche. There is a arch niche in the west wall, which has a double-recessed entrance. The top of the niche depicts 15 apsaras, and on either sides of the Buddha is a picture of seven disciples and six bodhisattvas. On the lower part of the west wall is Mrgasirsa. The niche beam is decorated with the honeysuckles, incarnated boys out of the lotuses, and pearled borders. The two sides of the west wall of the outer niche each have two images of bodhisattvas, while the north and south walls each have two apsaras and two bodhisattvas. The beam is decorated with flame motifs, which extend to the west slope of the ceiling. Above the niche are four asparas, and inside the beam are incarnated children and musicians. Two bodhisattvas are painted on each of the south and north sides. The outer brim of the niche is decorated with a pearled border,and above the niche are 14 apsaras. The upper parts of the south and north sides of the west hall are covered with the Vimalakirti sutra illustration. Manjusri is painted on the south side. Manjusri sits in the center of a hall with an East Asian hip-and-gable roof, the celestial beings and bodhisattvas all stand behind Manjusri. The disciples kneel on heels in the corridors listening to the preaching with palms joined. Behind the hall are prosperous green trees, and in front of the hall is running water in which water birds play in pairs. Upper in the sky are apsaras scattering flowers. Vimalakirti is painted on the north side. He sits in the center of a hall also with an East Asian hip-and-gable roof, holding a whisk in his right and leaning forward against a desk. The hall, corridors and under the steps are crowded with the listeners. In front of the hall is a lotus pond and behind is a group of trees, symmetric to those in the picture of Manjusri. The lower parts of the two sides each present five disciples and four bodhisattvas. The lower part of the west wall has traces of the offerings and 12 worshipping bodhisattvas painted in the Song dynasty. The north wall has a central shallow niche amid the thousand Buddha motifs. The niche has a three figure group: a seated Buddha and two attendant bodhisattvas. On the lower brim of the kasaya are several symbols of sovatthika. On the top of the niche are two apsaras and the halo with flame and honeysuckle motifs. Five disciples are painted on either side of the Buddha and a lion on each side of the throne. The brim of the niche is decorated with pearled patterns. There are 14 worshipping bodhisattvas painted in the Song dynasty below the niche. The whole east slope is devoted to the illustration of the Universal Gate of Avalokitesvara in the Lotus sutra, some scenes of which extend to the north slope. The scenes can be divided into two parts: Avalokitesvara rescuing people from trouble and the thirty-three manifestation of Avalokitesvara. The former refers to the records that Avalokitesvara can help people out of eight kinds of disasters, free people from the three evil things: lust,anger, and imbecility, satisfy people's desire for obtaining a daughter or a son; and the latter refers to that Avalokitesvara can manifest as the Buddha,Pratyekabuddha,Shravaka, Brahma, Indra and etcs. In composition, the paintings of Pratyekabuddha consists of three levels, one above another, and the episodes also develop from right towards left in horizontal bands.However, the exact depiction of these scenes has broken the limits of the space and time, and then it can be divided into three parts: the upper band is devoted to one of the eight salvations, namely saving people from being robbed.The middle band and the right half of the lower band are covered with dense scenes of the other seven salvation. The left part of the lower band is used for the thirty-three manifestations, which are not completely rendered. Due to the changes of colors, many scenes have become obscured and the characters and costume styles are hard to identify. The scenes of this part also extend to the neighboring east side of the north slope. The scenes on the south slope highlight many buildings, including temple halls and lobbies, which are enclosed by L-shaped walls. They are used to depict the scenes of the houses on fire in the Fables of the Lotus Sutra. The picture focusing on the buldings are divided into three vertical parts strips by the characters, mountains and chariots, and so the buildings are divided into the left and right vertical groups to emphasize the "dangerous house on fire" and the three "vehicles helping people to escape." The middle part depicts the other scenes, which start from the right side and extend to the left. Between the two groups of buildings, there are three vehicles, namely the chariots drawn by a goat, a deer or a white ox from top down, and in the lowest center are three preaching scenes of seated Buddhas. On the whole, in this picture, the figures are in the center, and the three vehicles are used as a symmetrical axis for the scenes on both sides. The picture on the west slopes consists of three horizontal bands, and each band include several preaching scenes, which add up to 23 altogether. Part of the scenes extend to the south and north slopes.Between the preaching scenes are figures in various arrangements and performing bands, treasures, temples, chariots, elephants, and etc. There scenes together illustrate the episodes of "Bodhisattvas giving alms of elephant-chariots," "bodhisattva giving alms of chariots drawn by four horses," and "bodhisattva offering his flesh, hands and feet" recorded in the Introduction of the Lotus Sutra. There parts in the middle and lower bands on the west slope which connect those on the north slope are scenes of "the gods and secular people inviting the Buddha to accept the last offering" that are borrowed from Vol. I, Longevity of Paranirvana to express the idea of Expidency of the Lotus sutra. The picture on the north slope can be divided into three parts. The center of the picture is a large-sized scene of Buddha entering nirvana. The other scenes are arranged around it. The picture on the left side is divided into three levels with eight preaching scenes and other scenes. The picture on the right side is relatively small, including the scene of "two Buddhas sitting side by side," "Mt. Vulture" and other scenes. These scenes together present some episodes from the Introduction, Expediency, Beholding the Pagoda, and the Universal Gate of Avalokitesvara in the Lotus sutra. In the painted laternendecke design on the ceiling, there is a three-rabbit motif in the center decorated with lotuses around. The inner corners are filled with boy-like apsaras and the outer corners with winged beasts. The outer frame of the square ceiling is decorated with honeysucle, lions and pearled motifs. There are draperies on the four sides which are formed by multilayers of scales and triangles mainly in black, brown, and redish brown.The four slopes are covered with large-sized sutra illustrations, in which the scenes are separated by images of trees, flowers, temples, springs, ponds, or clouds. However, the density and discolor of these paintings on the four slopes make it very hard to decipher, therefore, opinions about the contents of the four slopes differ. In conclusion, there are mainly two opinions: 1. they are painted according to the Lotus Sutra, and 2. they are painted according to the Lotus Sutra and the Nirvana Sutra. The description agrees with the first opinion. On the north and south slopes are draperies. The corridor was repainted in the Western Xia. In the center is a medallion motif.